A number of nuns from the Forest Tradition came to visit yesterday afternoon. After a morning roped to my computer I’d climbed up the hill to sit in the sun and drink in the valley readying myself for tomorrows adventures in the sky. 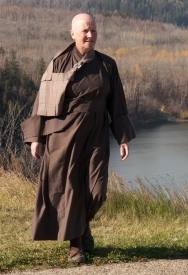 Seeing a monk waving me down, a small figure in the landscape at that distance, I extracted myself from my perch and made my way to meet the nuns. They were already tucking into tea, chocolate and conversation in the common room. This is a picture of our side of the valley where I was sitting. The monastery is in the center of the picture, more or less. ….I would just like to wish you ‘rruga e mbare’ for your journey; loosely this is Albanian for bon voyage but better translated as ‘may your way go properly’ (rruga = way, mbare = properly), an expression I like and that is my wish for your travels. From Tim. Thanks for keeping in touch. Keep on writing your blog.